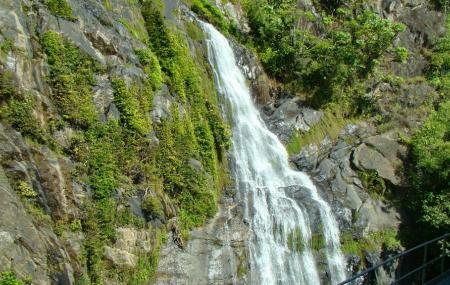 Wish to experience spectacular natural beauty of Cairns? If yes, Stoney Creek falls is surely going to please you. Just 15-20 minutes north of Cairns, this beautiful waterfall is worth a visit. Surrounded by the tropical forest offering swimming holes, you can spend more than hours without even realizing it. Some of the swimming holes are quite shallow and safe for children to dive into it. Seeing the mesmerizing scenic beauty around the falls, you will not be able to stop yourself from pressing the shutter of your camera constantly. Visit the place in early morning as the attraction gets crowded with daylight. Wear trekking shoes as the tracks sometimes becomes slippery. Carry plenty of drinking water and small snacks. The place is little known among the tourists. So, it’s best to speak with locals for the direction. How popular is Stoney Creek Falls? People normally club together Australian Butterfly Sanctuary and Great Barrier Reef while planning their visit to Stoney Creek Falls.